I couldn’t stop thinking about zucchini bread yesterday morning. It was a freezing March day, definitely not peak zucchini season in the northeast, but my craving for the dense, rich, raisin-studded goodness came from a wave of nostalgia. I had been thinking about Mason’s first birthday party, then about the day Mason was born (August 19). It was blisteringly hot outside and I was sitting in the waiting room of Beth Israel, about to have a C-Section, and all I could think about was food. I wanted my mother-in-law’s zucchini bread and a giant apple-cherry smoothie, and I wished and wished for it all to materialize. Of course my doctor wouldn’t let me eat or drink a thing and I couldn’t manage more than a few ice chips post surgery, so my fantasy never came to fruition. I considered baking a loaf. We had some organic zucchini in the fridge and I could run to the store for everything else. Mason would probably have appreciated the outing. We had been up for hours and he was definitely over his Exersaucer, books, and everything else I presented as entertainment. Then it occurred to me that perhaps I had been craving zucchini bread that August day because Mason had an affinity for it too. If he liked the stuff as a fetus perhaps he would enjoy it now, even if it wasn’t tucked inside a sweet, cake-like bread. Perhaps zucchini could be a green veggie puree that Mason would love, maybe even crave. Inspired, I ditched all thoughts of bread baking and got to work. Zucchini — a rich source of folate, potassium, and vitamins A and C — is so mild that I decided to combine it with something more flavorful. Carrots, a powerhouse veggie of vitamins, minerals, and eyesight boosting beta carotene, were a great match. I started by washing and peeling the zucchini — the skins get rubbery when cooked, an unappetizing choking hazard, in my opinion. I diced, cooked, and pureed the stuff. It blended up lime-colored, mild and delicious. Then I stirred in a jar (to avoid excessive nitrates) of Earth’s Best carrots. Together, the veggies had a gentle carrot flavor, very simple and straightforward. The color was like orange crayon, not the fiery orange of carrots pureed straight. I was still hiding the green with a yellow veggie foil, but the puree was vitamin rich and yummy, success nonetheless. It reminded me of zucchini bread, but this one was for babes. 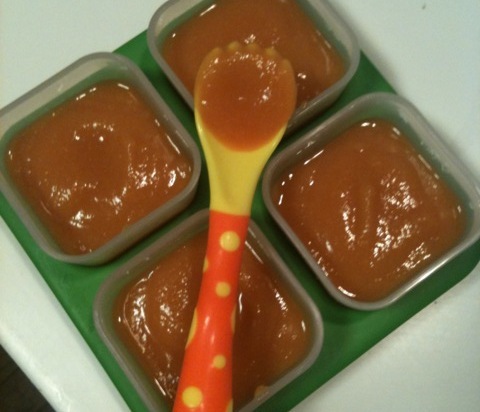 I made this new puree just in time for Mason’s Sunday lunch, and blessedly he gobbled it up. I hope your babe enjoys it too. Let me know — and please share your fun zucchini ideas! 1. Peel the zucchini, dice, and cook until tender (about 15 minutes). Reserve cooking liquid. 3. Blend until you reach desired consistency, very smooth and thin, akin to Stage 2 purees. 4. Combine zucchini puree and jar of carrots until well mixed. Makes about 10 ounces of puree.